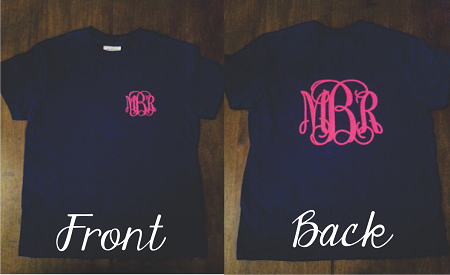 Small Monogram on the front & Large Monogram on the back! This beautiful casual t-shirt makes a bold statement! There are so many beautiful color combinations, you might need a few! Monogram is approx. 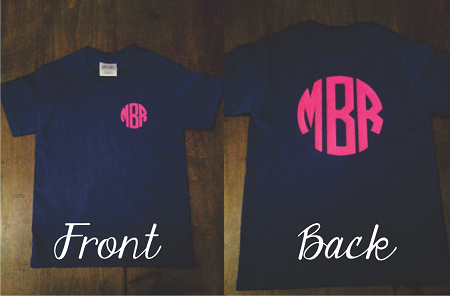 4 inches on the front left chest, 8" tall by 10" wide on the back of your shirt! A year-round essential, our best-selling t-shirt has been voted "most popular"! Heavyweight 6.1-ounce, 100% cotton Shorter cut through the body and sleeves for a more feminine fit Shoulder-to-shoulder taping Cover seamed neck Double-needle hem CARE INSTRUCTIONS Machine wash cold, inside out with like colors. Only non-chlorine bleach when needed. Tumble dry medium. Do not iron.